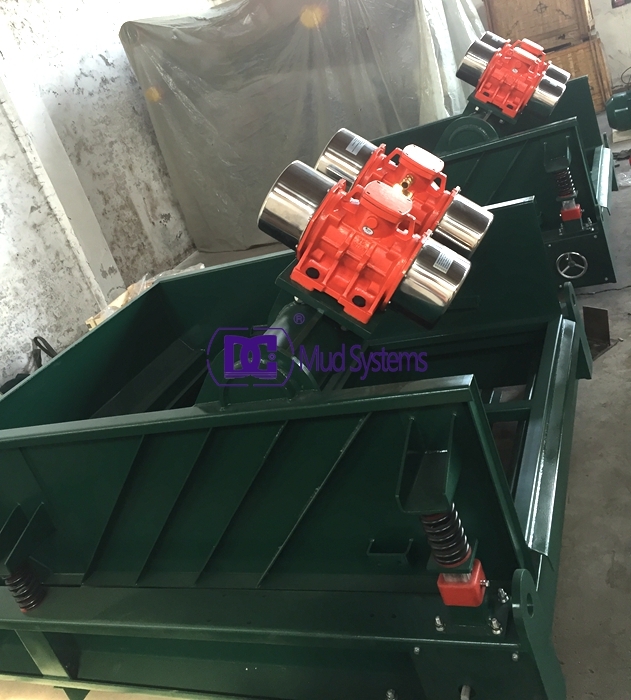 A mud recycler is a solids control device designed to filter and clean drilling fluid coming back from a drill bore. The main functions of drilling fluid are to provide hydrostatic pressure to prevent formation fluids from entering and to stabilize the bore, to keep the drill bit cool and clean, to carry drill cuttings back out to the surface, and to suspend the drill cuttings while drilling is paused or during the pullback process. 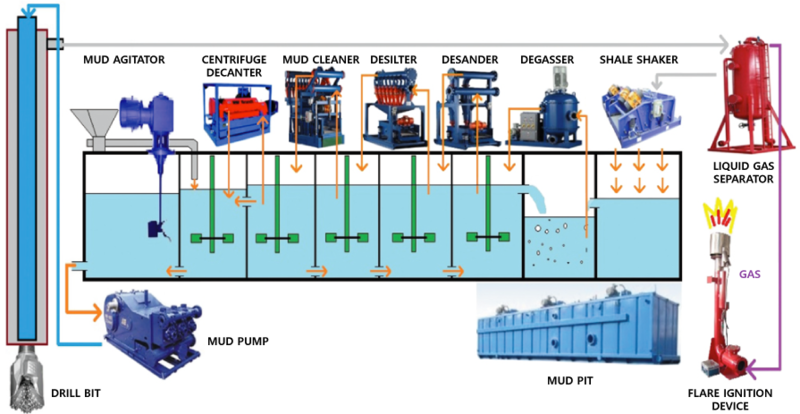 Normally, a solids control system consists of a mud tank with compartments for both incoming dirty and cleaned fluid, a shale shaker, a desander (depending upon the size of the unit), and a desilter. The shale shaker separates larger solids approximately 400 micron and larger, the desander separates solids approximately 100 micron and larger, and the desilter separates solids approximately 40 micron and larger. After the fluid processes through the desilter and deposited into the clean tank, it can then be pumped to the mud pump to be pumped back downhole. DC Solid control is a professional manufacturer of drilling mud circulation system. 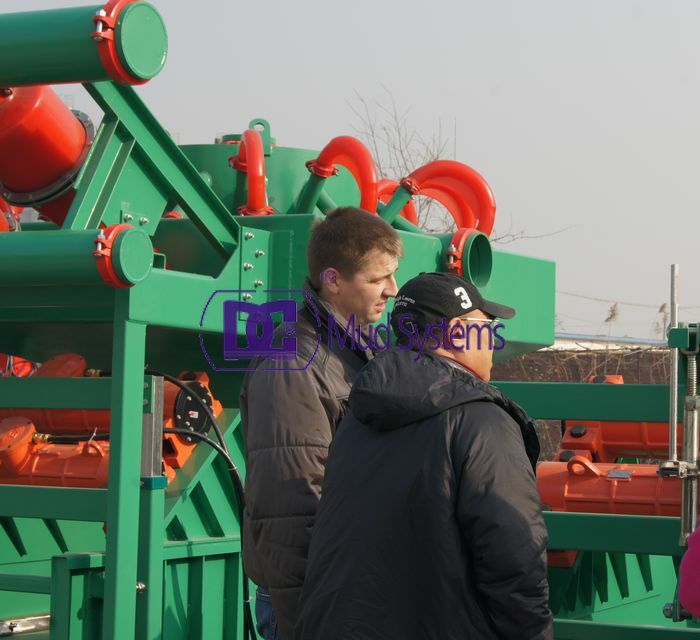 We can provide varies models and capacity mud system for your choose, and can design and manufacturing it according to clients special requirements. 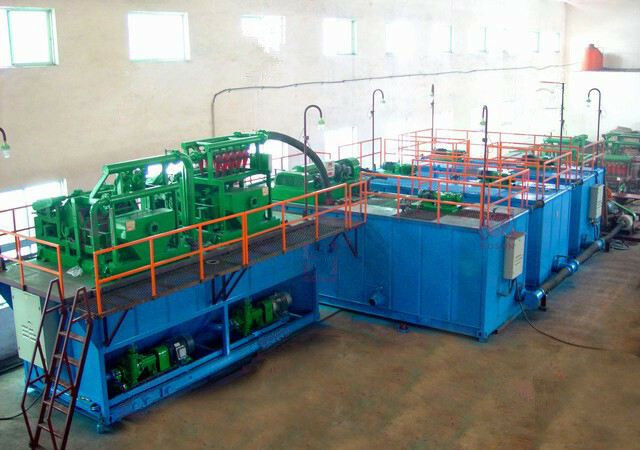 The drilling fluid circulating system is like a close loop electric circuit through which drilling fluid (i.e. 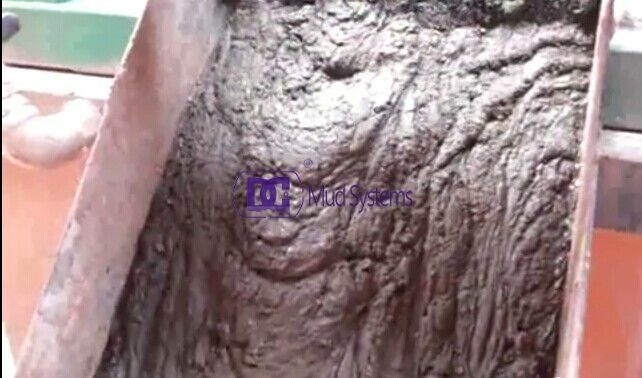 mud) can travel from surface to all the way down hole and back to its initial point. 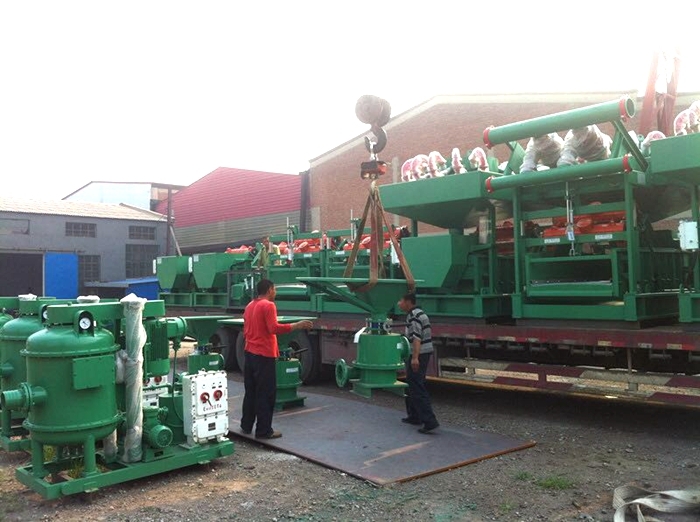 The main component of the drilling fluid circulation system include shale shaker, desander, desilter, vacuum degasser, decanter centrifuge, mud tank, agitator, centrifugal pump. mud hoppers and ect. 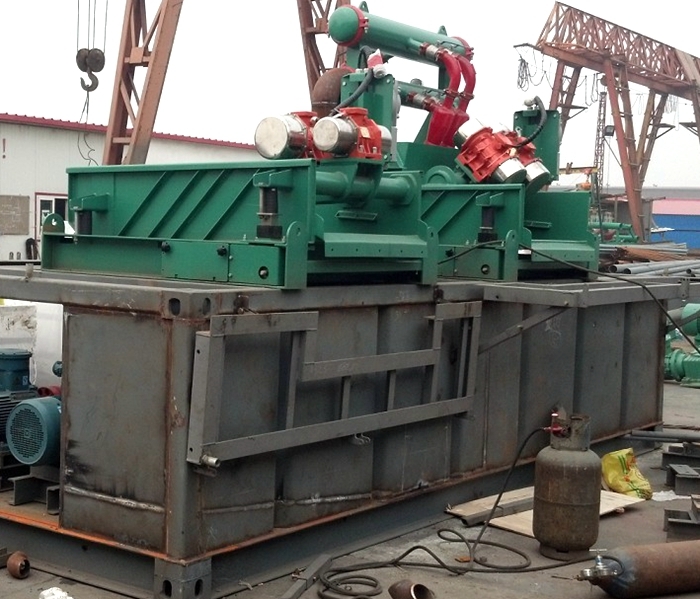 The drilling fluid circulation system also called solid control equipment or solid control system. The function of the Drilling fluid and equipment maintenance cost can decrease greatly when proper solids control practices are utilized. From a fluid control stand point it would be desirable in most cases to remove all drilled solids. Although this is possible, it would be cost prohibitive. The goal of a solids control system is to achieve the balance between mechanical solids separation and dilution that will result in drill solids being maintained at an acceptable level with a minimum of cost. There’s no doubt that drilling fluids (or mud) play a crucial role in drilling activity and efficiencies today – cooling and lubricating drill bits, carrying drill cuttings to the surface, controlling pressure at the bottom of the well, and ensuring that the formation retains the properties defined for that well. 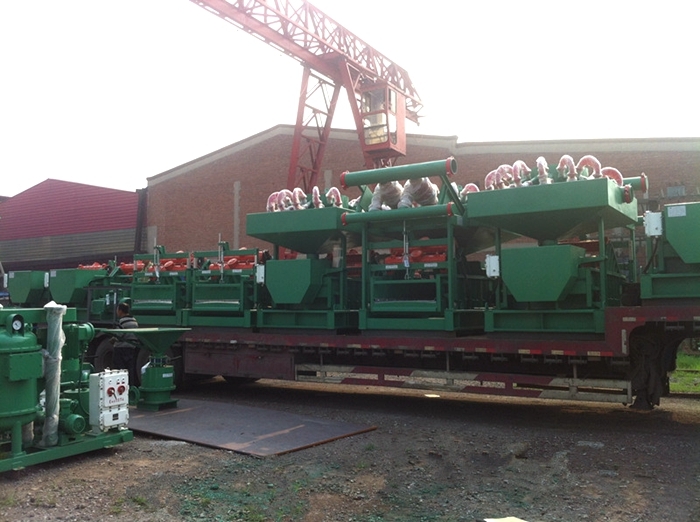 For many years, the maintaining of drilling fluids and the separation of rock particles was down to shale shakers. Through vibration and high G-forces, solids were filtered out for overboard discharge or for treatment on the rig or onshore. The cleaned mud was then incorporated back into the active fluid system and reused to drill the well. 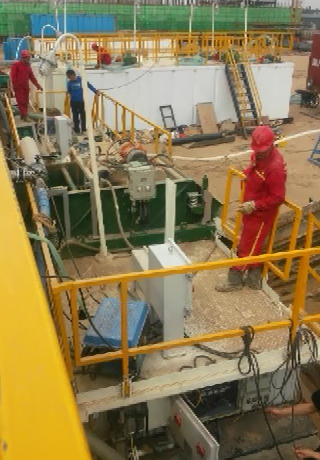 Now, all drill rig site use solid control system to recovery the cleaned drilling fluid. 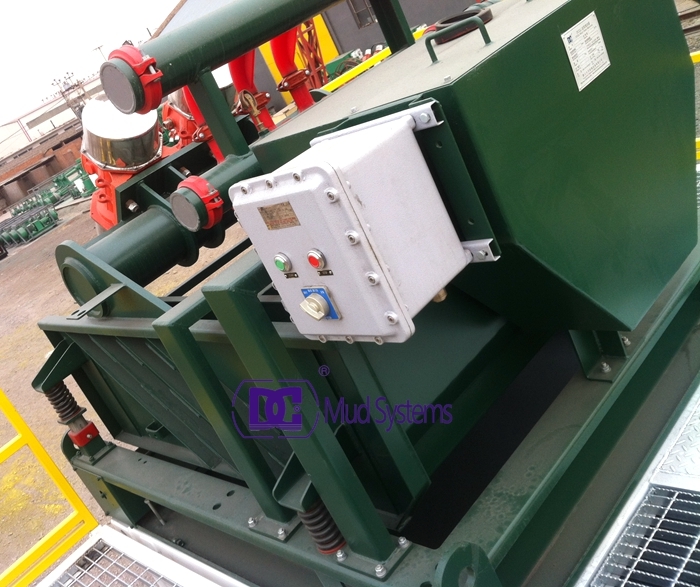 The main solid control system include shale shakers, mud cleaners, decanter centrifuges, mud tanks, vacuum degasser, agitator and related equipment. DC solid control is positioned to offer complete fluid solutions to our customers. Optimization of Solids Control and Waste Management systems with drilling fluids on a project provides our customers with economic and effective solutions to the most challenging drilling environments. At the end of last month, customers from a well-known engineering service company in Russian visited Tangshan Dachuan Machinery Co.,ltd. is short for DC Solid control and had detailed negotiation on business cooperation with DC teams. In the early winter, DC Solid control finished the production of our standard solid control system within 30 days. Below is the picture of the users senior engineer inspection. 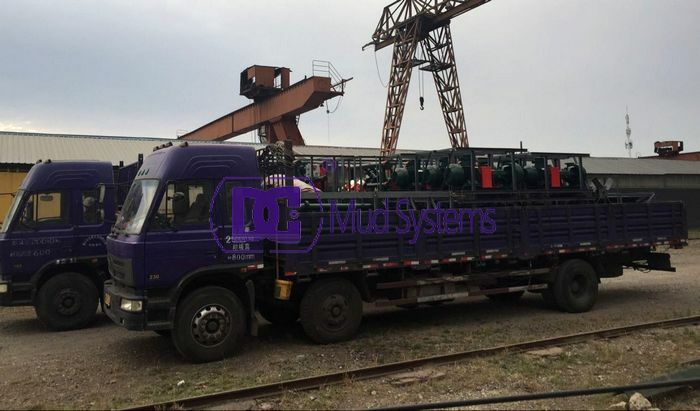 The order of solid control system mainly include 6 sets linear DCS700-3 shale shakers, 3 sets DCQJ250 Mud cleaners, 3 sets DCLW450-1258 decanter centrifuges, 20 sets mud agitataor and 8sets centrifugal pumps. DC Solid control system not only can design equipment for oil and gas field but also can provide perfect system for HDD, CBM, and other on dig drill fields. Following the development of trenchless field, more and more site require the MiNI-mud cleaning system to remove the big solids. In order to meet it, DC Solid control has standards mud system for your choosing, such as DCGPM500, DCGPM900M, DCGPM1000 and design for according to your special request. If you have interest with solid control system, welcome to contact us. 1. 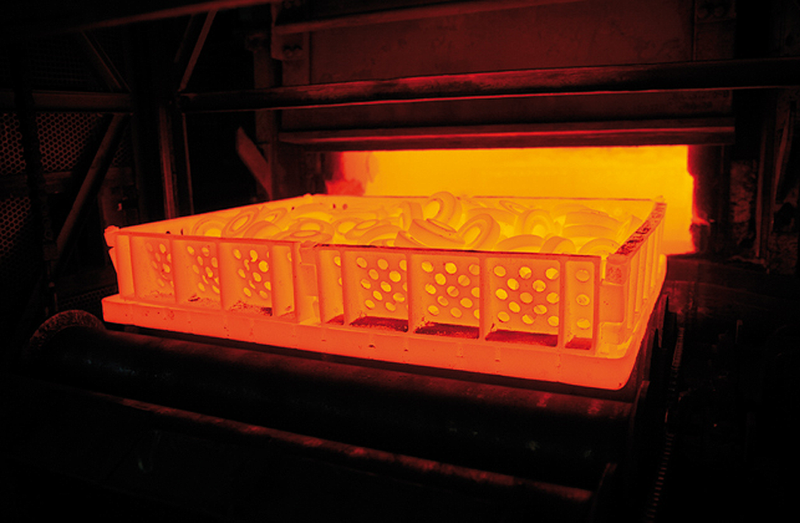 Heat treatment usually won’t change the shape and chemical composition of the heat treated materials. 2. Change the internal microstructure of the heat treated material or surface chemical composition, and further change the application performance of the material. 3. Can enhance the hardness, toughness, strength, wear resistance.of the material being heat treated. 1. Improve the processing and using properties of the steel. 2. Extend service life of the product. 3. Saving product materials and energy loss. 4.Eliminate stress, casting is not easy being deformed under strong case, maintain its performance. 5. Effectively increase the wear resistance of the steel and change metal material properties to make it plays at a maximum. Heat treatment operation methods are generally as follows: aging, quenching, tempering, carburizing, nitriding and so on. The shaker decks of shale shakers produced by Tangshan Dachuan Machinery Co., Ltd are all have strict heat treatment, which makes the screen deck becomes stronger in hardness, better in toughness, more abrasive wear resistant to drilling fluid particles, vibration strength generated by the motor reached 7.6G, the screen deck after heat treated will be more vibration resistant. Petroleum solid control system is mainly for oil drilling solids control and separation , enabling the drilling fluid recycling, also called mud purification system . Procedure applies to 2000-7000 meters of drilling wells , oil solid control system consists of 3-7 body composed of modular combinations ; purification jars conical bottom end using the new structure, the edge of the mud mixing system using easy grit ; entire circulatory system between the tank and the tank , between the warehouse and the warehouse that can be separated and can Unicom to meet the needs of drilling operations , including the bottom of the suction manifold valve is open and flexible, reliable sealing after closing . 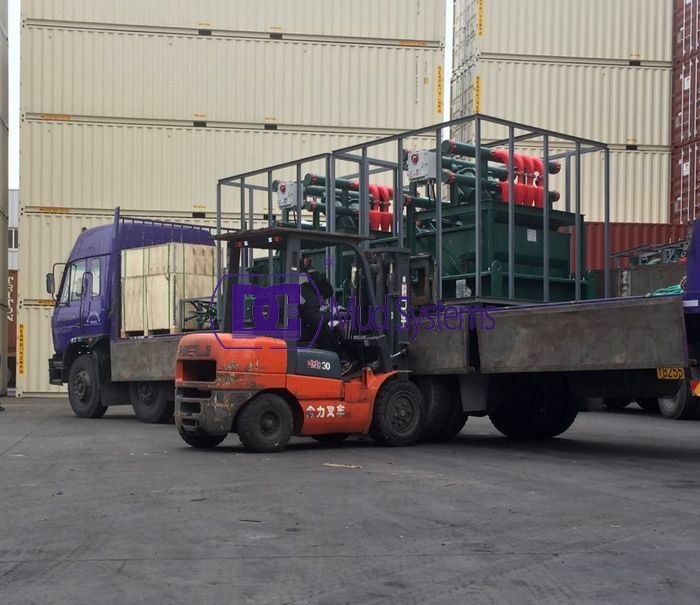 The entire circulatory system configuration 5 purification equipment, ancillary equipment in the shaker, mud cleaner Desanding addition , except for the use of air and vacuum blender , new oil drilling mud purification system , reducing emissions from the mud , with obvious environmental protection. Solids control system for oil separation process, the drilling fluid debris , silt and other particles , to maintain circulating drilling fluid performance and storage . With increased mixing device , infusion devices and chemical filling device . For improving the physical and chemical properties of the drilling fluid to meet the needs of drilling work.